The seven-year-old gelding becomes only the seventh horse to reclaim the prestigious accolade. Long Run ridden by Sam Waley-Cohen on their way to winning the during the William Hill Winter Festival at Kempton Park Racecourse. LONG RUN BECAME only the seventh horse to reclaim the prestigious King George VI Chase crown as he edged Captain Chris by a neck in a thrilling finish here on Wednesday. The seven-year-old gelding – ridden as ever by Sam Waley-Cohen – was always prominent but a terrible mistake five from home looked to be costly in the gruelling contest raced on heavy ground. 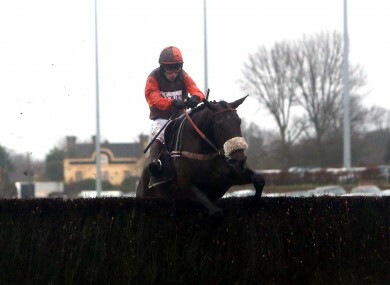 However, Waley-Cohen – who rode him both to King George and Cheltenham Gold Cup glory in the 2010/11 season – conjured up a terrific last effort from the 15-8 favourite after jumping the last to get past 16/1 shot Captain Chris, who looked to have won the prize after finishing third last year. Grands Crus finished third at 7/1 while long time pacesetter Champions Court ran a cracking race to end up fourth. Long Run joins such greats as Kauto Star and Desert Orchid in regaining the crown after relinquishing it the year before. “He was so brave!” gasped Waley-Cohen, who is a dentist by profession. “I had to keep asking him questions but he reacted courageously. He really is a brave lad!” added the 30-year-old. Waley-Cohen’s father Robert, the owner of Long Run, said that it had been a wonderful experience. “Well there was no Kauto Star (who had been paraded before the races temporarily taking time off his new duties as a dressage horse) but he still had to win it and it is fantastic, wonderful,” beamed Waley-Cohen, who was draped in a scarf in the colours of his star. The winning trainer Nicky Henderson admitted his heart was in his mouth when Waley-Cohen set sail for home five fences out. “Both horse and rider covered themselves in glory and guts in spades,” said the 62-year-old. “It was a brave call to go on when he (Waley-Cohen) did but I guess it was the right one. Captain Chris’s rider Richard Johnson was full of praise for his mount but especially for the winner. “The winner must be an outstanding horse,” he said. Bookies were not quite so impressed cutting the winner from around 10/1 to 8/1 to reclaim his Gold Cup title – the ‘blue riband’ of the jumping season – in March at Cheltenham while such is Henderson’s strength in depth he also trains the 9/2 favourite in Bobs Worth. Email “Courageous Long Run reclaims King George crown”. Feedback on “Courageous Long Run reclaims King George crown”.